On Sunday night, it was the eve of the lunar new year, so I got busy and made us a new year meal. 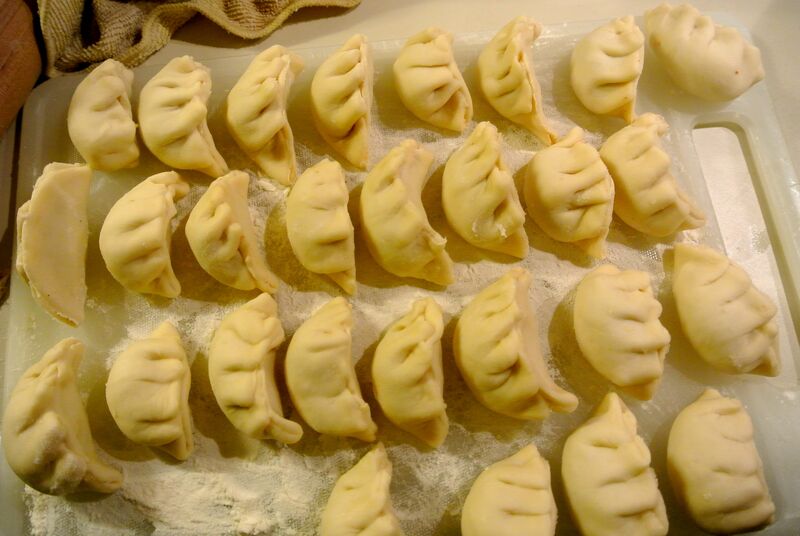 While I was in China, I learned to eat boiled dumplings for new year (and at any other opportunity that I could find). There was a great restaurant that Ali and I used to go to in Harbin called Eastern Dumpling King that had a whole menu of dumplings, with some dishes on offer to go on the side. It was 40 minutes away by bus from the remote agricultural university where I taught, but we happily sat on the clanking bus and dreamed of the fat dumplings that awaited us. The place was always packed and very noisy, with waiters wandering around carrying kettles of dumpling water for anyone who fancied it. These boiled dumplings are not something I grew up with, either as a daily meal or as holiday food. We had other dishes that we made for new year, and with some luck I will be making those later in the week (one thing I love about Chinese new year is that you get to celebrate the heck out of it). But I did grow to really really like boiled dumplings, so I thought I would take a stab at making them. I used lamb since we can’t really get pork here (not in Antalya, anyway, though we do get the odd wild boar)n and I don’t like using chicken instead of pork — it feels too much like a compromise to me. I had planted some loose leaf Chinese (napa) cabbages using seeds from Kitazawa Seed Co. that I was very excited to find — heading Chinese cabbages always bolt on me before they form decent heads, so I am eager to see if I will have better luck with these. 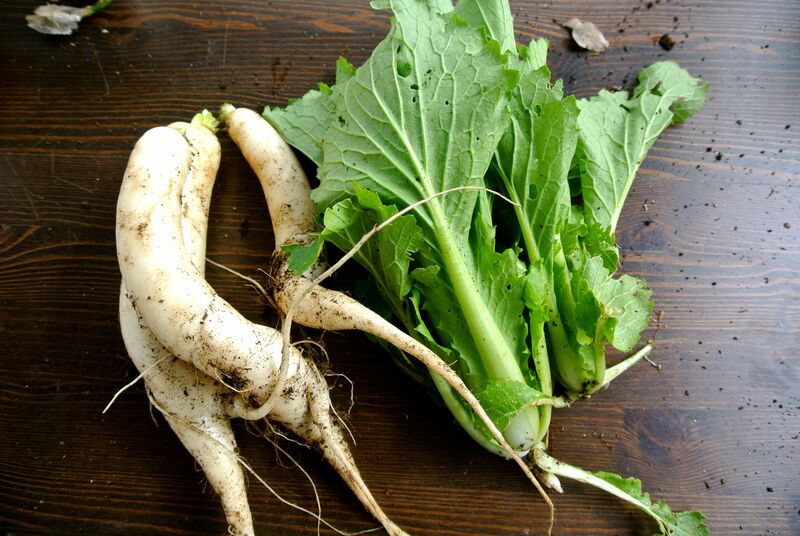 I needed to thin them out, so I thought I would use the ones I pulled in the dumplings, along with a few daikon from the root vegetable bed. I was being guided in this enterprise by Fuchsia Dunlop’s recipe for boiled dumplings, and she advised salting the veg and squeezing out the water, which I did and was glad of it — lots of water came out! 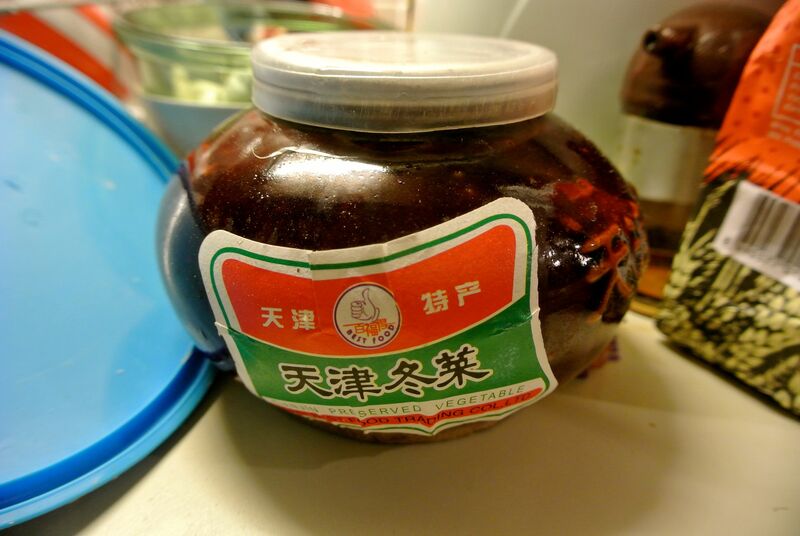 I made the filling using ground lamb, hua tiao wine, a bit of sesame oil, some salt, ginger and some stock. And I followed the instructions about wrapping in the book to the letter, making a plain flour and water dough and then rolling it into logs, cutting bits of dough and rolling them individually before filling and pleating. 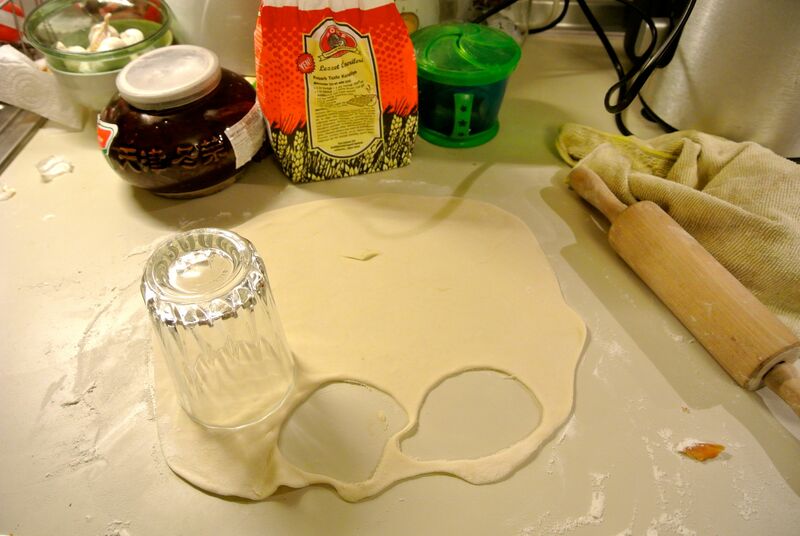 This was all familiar from when I had made dumplings with friends. The only problem was, I was horrible at it. My dumpling wrappers were huge and malformed so that when it came to filling and folding, they turned out really wonky. The resulting dumplings didn’t taste that bad, they just looked horrible. And I thought that the filling had turned out a little on the bland side. All was not lost, though. I only made it through about half of the filling on Sunday night because we had fish and veg and steamed egg cakes to eat as well. So I decided that tonight was time for take two. 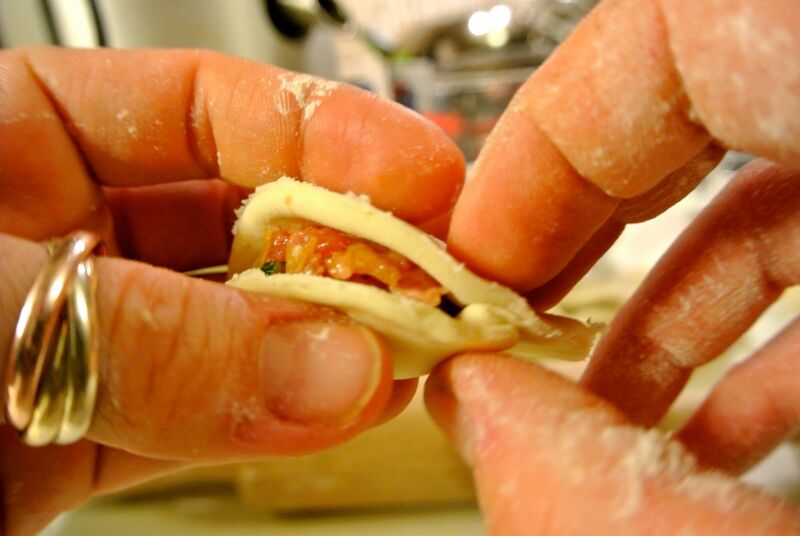 First, I added a little Tianjin cabbage to the filling. This stuff is mighty — salt, cabbage and garlic. Stinky, salty heaven. Then, I took a cue from my good friend Maia. She is an insanely good cook who makes these amazing Georgian dumplings. Everybody goes insane for the, so much so that she makes them to sell. This is a woman who can make a thousand dumplings in a night, and does she roll each disc out individually? No! She gets a drinking glass out and cuts them out. (That’s a toy rolling pin, by the way — for some reason I have never gotten around to getting my own, so I steal the boys’.) I know that there are “advantages” to rolling them out the right way, the way that Chinese women have been rolling them out for thousands of years. But I never once stopped while eating a plate of Maia’s Georgian dumplings and thought, “The edges of these dumpling wrappers are not thinner than the middles.” So I decided that if the drinking glass was good enough for Maia, it was definitely good enough for me. After that, it all fell in to place. Just remember, I told myself, don’t be greedy with the filling. Just a little bit. All I had to do was cheat! p.s. — I wanted to show you what they looked like cooked, but the camera battery died on me. I ate them with black vinegar, soy and lots of chili oil. They were dreamy. The cabbage seeds sound interesting – my attempts at growing chinese cabbage always end in bolting or total decimation by slugs ! I’d be happy to pop a few seeds in the mail for you to try. My email address is siobhanwilde@yahoo.com. We could compare notes! It is a nice manageable little thing. I just have to be sure to get the play dough off it first! 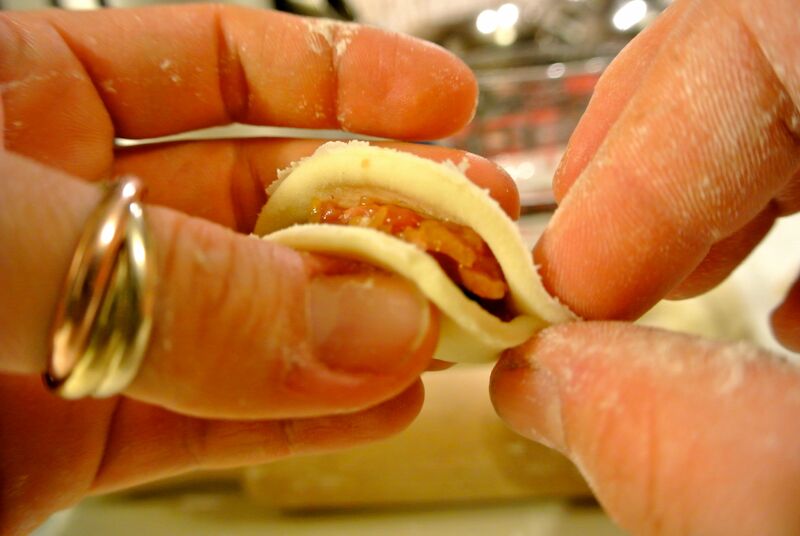 Beautifully pleated dumplings…perfect for your celebration. I think your dumpling look gorgeous, Siobhan! Bravo! 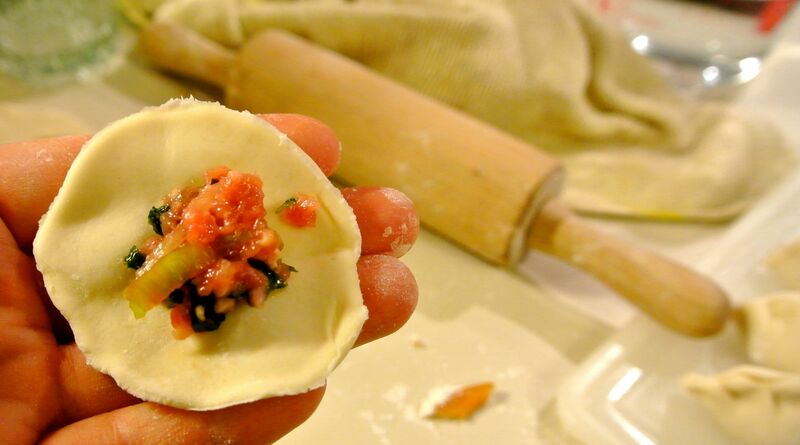 Dumplings are such a project! I didn’t grow up with them either, but love them. My mother has friends from Northern China and they can just sit around and pump out scads of perfect ones while sitting around and chatting. Like a tamalada but with dumplings. Good tip with the salting of the vegetables. I will have to remember that! I guess if it works with eggplant, it must for all vegetables too. Those are some perfect dumplings ! It’s all in the angle… They don’t bear close scrutiny, but they were tasty.